It has become a difficult job to describe Pixar’s overall excellence over the years, the old saying “we’ve run out of adjectives” has become solid fact for the animation studio. It all began with Toy Story in 1995, and despite some dips in quality here and there, there is an important distinction to be made. Every “dip” is only in comparison to their own tremendous work and each movie retains a higher level than most films, and any dip in the past has been an aberration rather than a consistent regression. In other words, they’ve never made a bad film, and whenever they’ve had one that wasn’t as good as the last one, they’ve always made the next movie better. This is never more evident than in the last 6 years of Pixar’s history. With Brad Bird’s The Incredibles, Pixar entered a new realm of overall greatness that surpassed much of their earlier, already fantastic work. But the new level of quality was short-lived, with a movie many say is the worst of the bunch, Cars, in 2006. Again, it might be the worst of the Pixar roster, but it certainly beats most movies that come out in any given year. Never mind, though: Pixar then went on a streak of next-level critical response with Bird’s Ratatouille in 2007, followed by WALL-E, and then last year’s magnificent Up. So here’s how high the bar has been set by four of the last five films: Toy Story 3 is a slight dip from their latest, if only because it’s not an original work, much of it reliant on its predecessors, and it doesn’t keep the ambitious “there are endless possibilities” feel of those recent movies. I can say I’m kind of surprised that Pixar didn’t look at Toy Story 3 and try to blow the lid off of the franchise’s own formula, especially considering it’s been 11 years since Toy Story 2 hit screens, and Pixar always seems to be looking to blow our expectations out of the water. 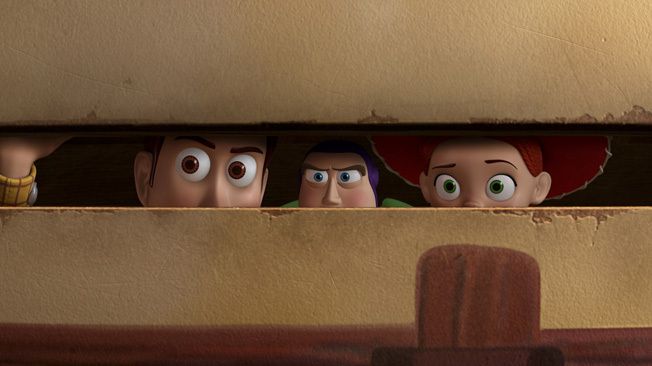 Still, Toy Story 3 is as good, or better, than the previous entries, and that’s still very, very good. In the latest adventure, cowboy Woody (Tom Hanks), cowgirl Jessie (Joan Cusack), and space ranger Buzz Lightyear (Tim Allen), along with their crew of toy followers including Rex (Wallace Shawn), Mr. Potato Head (Don Rickles), his wife (Estelle Harris), piggy bank Hamm (John Ratzenberger, who has voiced all 11 Pixar films), newcomer Barbie (Jodi Benson) from Andy’s sister’s stash, and Slinky Dog (Blake Clark, taking over for the deceased Jim Varney), find themselves again being threatened into obscurity, this time by owner Andy’s (John Morris) going away to college. Andy’s mom (Laurie Metcalf) wants him to clean out his room, including donating his old toys, but Andy feels like the attic is the best place to put them, except for Woody, who is going to stay with Andy. Of course, there is a misunderstanding, as the other toys are put in a garbage bag, which ends up finding its way outside with the trash. There’s an escape, and the gang end up at a day care, where they are met by the teddy bear with a cane Lotso (Ned Beatty), the father figure of all the toys at the place. Here they also meet Ken (Michael Keaton! ), and it’s love at first sight between he and Barbie. Lotso seems like a beloved grandfather, but you know, watch out for any character with a cane or wheelchair, because they’ve been scorned. He shows them how great the day care is, and how they’ll be living in paradise. There are two separate rooms, however. One is with kids who know how to love toys, and the other is ransacked by age-inappropriate toddlers. You can guess which one we find our heroes in. So the rest of the movie is all the toys finding themselves held prisoner. One of their lone hopes, Buzz, gets reprogrammed back to his delusional self and becomes one of Lotso’s minions, and their other hope, Woody, finds himself in an adventure to get back to the day care, including getting “adopted” by young Bonnie (Emily Hahn). In other words, the plot is similar to the other Toy Story films: the toys are afraid of not being played with, they find themselves in a place that is dangerous for toys (in the first, Woody found himself in Sid’s psychopathic bedroom, in the second, it was Al’s Toy Barn), all caused by some basic life decision by their human owners (in the first, a residential move, in the second, a yard sale). So if you’re looking for an evolution in plotting, we don’t get it here. However, the movie is consistently funny and entertaining: all of the Toy Storys find a way to take a basic toy and give them a personality befitting of their stature. And once again Pixar understands the way children act and puts it in the movie. So many times we watch movies and the kids are annoyingly precocious, but in most Pixar films the kids act like kids do (of course, it’s difficult to find a child who will act like a child, and it’s much easier in animation, but still, it’s refreshing). Bonnie is a wonderful creation, shy around strangers but with an amazing imagination that makes her come alive when we see her alone with her toys, much like we saw with Andy in the original. Speaking of which, if you remember the original’s opening scene, Toy Story 3 basically makes an “adaptation” of Andy’s imaginary robbery sequence and blows it up into a breathtaking 3D spectacle. This is a fun movie all around, but I still hope that in future sequels, and we’ll be seeing a Cars 2 and Monsters, Inc. 2 in the future, that Pixar decides to take a chance and strive for the kind of excellence we’ve seen with their recent originals. It’s easy to see that they are not immune to the demands of the almighty buck, but I’m hoping that they will find ways to subvert the sequel process and make us not dread them. Toy Story 3 shows that they can make a sequel at least as good as the others, but the likes of Cars 2 will have to up the ante for sure. P.S. : Another streak is still alive. Pixar’s shorts, which precede all of their features, also has a winning streak. The latest, Day & Night, is another clever and fun “warm up” to the feature presentation.